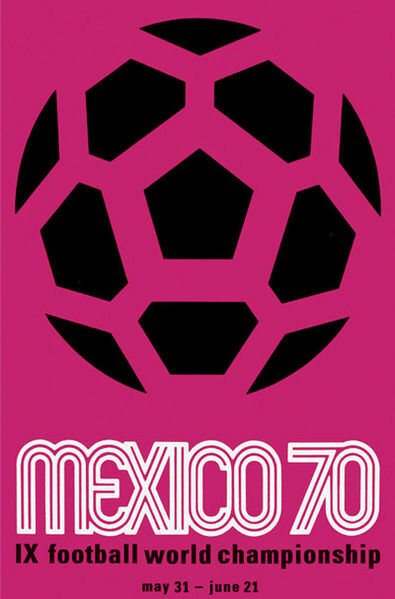 On 31 May 1970, Mexico and the Soviet Union kicked off that year's World Cup before a crowd of 107,000 at Mexico City's Estadio Azteca. The match did not go as the hosts had hoped, ending as a scoreless draw. Controversy erupted even before the players took the pitch, as FIFA scheduled several matches, including the opener, to start at noon. They claimed the early start time was intended to facilitate live television coverage for Europe, but many of the players complained that the noon starts would be too hot and would favor sides from warmer climates. Despite El Tri's home advantage, the Soviets were heavily favored, having advanced the semi-finals of the previous World Cup, then finishing in fourth place in the 1968 European Championship. Mexico, meanwhile, had never gotten out of the first round in any prior World Cup. On the day, however, neither side managed to threaten the other, making it an anticlimactic start to what would eventually become one of the most celebrated tournaments thanks to a dynamic Brazil side that won the trophy, their third, after beating Italy 4-1 in the Final. The match did see the World Cup's first-ever tactical substitution, as well as the first-ever yellow card in a World Cup match. Before 1970, substitutions were allowed only in case of injury and, while cautions and expulsions were used before 1970, the tournament was the first to use the card system. The first substitute was the USSR's Anatoliy Puzach, who came on for Viktor Serebryanikov in the 46th minute, while the first yellow card - one of five issued in the match - went to Evgeni Lovchev in the 40th minute. On 30 May 1979, Nottingham Forest won their first European trophy, beating Malmö FF in the European Cup Final before a crowd of 57,000 at the Olympiastadion in Munich. It was an incredible accomplishment for Forest, who became only the third English side - after Manchester United and Liverpool - to claim Europe's biggest prize. Forest were riding a wave of success under manager Brian Clough, who had taken Derby County to the European Cup semifinals six years earlier. After leaving Derby and suffering through a brief spell at Leeds, Clough moved to Forest in January 1975. Though they were in the Second Division at the time, Clough steered them to promotion in 1977, then to the League title in 1978. In the European Cup, Forest advanced with wins over Liverpool, AEK Athens, Grasshopper, and Köln. Malmö, who were also playing in their first European Cup Final, reached it by beating Monaco, Dynamo Kiev, Wisła Kraków, and Austria Vienna. Despite the participation of two relative Cinderella teams, the match itself was anticlimactic. Malmö, dealing with the loss of key players to injury, played a defensive game to slow the English attack. 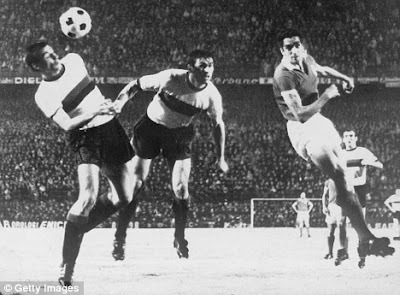 But Forest secured the match's only goal near the end of the first half, as their £1 million signing Trevor Francis - making his first European appearance for Forest - scored a 45th-minute header (pictured) that turned out to be the match-winner. Forest successfully defended their title the next season, beating Hamburg 1-0. On 29 May 1985, as Liverpool and Juventus prepared to play the European Cup Final in Brussels' Heysel Stadium, pre-match rioting resulted in 39 deaths and over 600 injuries. UEFA Chief Executive Lars-Christer Olsson later called it "the darkest hour in the history of the UEFA competitions." The trouble started approximately one hour before the scheduled kick-off time. Behind one of the goals, the opposing fans, who were divided into two sections separated by a narrow strip of unoccupied territory and bordered by chain-link fencing, began to throw bottles and stones over the fences at each other. As the situation grew increasingly hostile, a group of Liverpool supporters charged through and over the fencing into the Juventus enclosure. The Juventus fans retreated against a wall, which collapsed under the pressure. Of the 39 people killed, 32 were Juventus fans, while the other seven were neutrals. 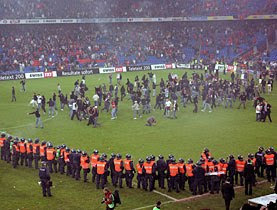 Upon seeing their fellow supporters attacked, the Juventus fans at the other end of the stadium began rioting and fought with the police for over two hours, even after the match started (officials chose to play the match for fear that cancellation would result in increased violence - Juventus won 1-0 with a 56th-minute penalty scored by their French midfielder Michel Platini). In response, UEFA banned British clubs from European competition for five years, with Liverpool receiving an additional three-year ban (later reduced to one extra year). British police investigated the incident and eventually arrested 27 people for manslaughter. In a trial held in Belgium, 14 people - all Liverpool fans - were given three-year sentences. On 28 May 1888, newly-formed Celtic FC played their first official match, a 5-2 win against Rangers. Newspaper reports from the time state that the match was friendly both in name and spirit, in contrast to what the meeting would become. Celtic were founded the previous November in the Calton district of Glasgow by Brother Walfrid, whose chose the name "Celtic" to emphasize the area's Irish heritage. It was a decision that linked the new club with Edinburgh's Hibernian, founded in 1875. Indeed, Celtic borrowed several Hibernian players for the match against Rangers (and would later sign several of those players the following August to Hibernian's detriment). Accounts of that first Celtic-Rangers match are sparse, but show that Neil McCallum scored Celtic's first goal of the day, and thus their first-ever goal in an official match. The Glasgow derby has since become one of the most hotly-contested rivalries in football, with Celtic and Rangers usually fighting one another for the Scottish league's trophies. To date, they have played a total of 387 matches in the league, the Scottish Cup, and the Scottish League Cup, with 155 Rangers wins, 139 Celtic wins, and 93 draws. 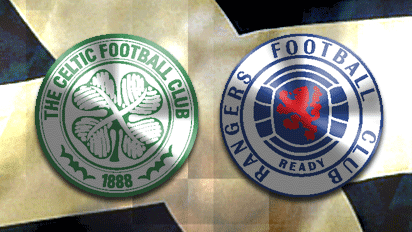 Between them, they have 100 league titles—Rangers have 54, while Celtic have 46, including the last four. Labels: Celtic F.C., Hibernian F.C., Neil McCallum, Rangers F.C. On 27 May 1965, Inter defeated Benfica 1-0 in the European Cup Final before a crowd of 85,000 at the San Siro. It was the second consecutive European Cup for the Italian side, who would not win it again until 2010. At the time, Benfica had themselves recently won two straight European Cups (in 1961 and 1962) and boasted the tournament's joint top scorers in Eusébio and José Augusto Torres (pictured at far right), both with nine goals. But Inter were playing at their home stadium, where, playing the catenaccio system masterminded by their manager Helenio Herrera, they had conceded only one goal throughout that season's competition. The Final thus shaped up as a classic battle of offense against defense. On the day, Inter were helped by the poor weather, with rain slowing both the pitch and the speed of the Portuguese attack. Inter received another lucky break when their Brazilian midfielder Jair de Costa took what appeared to be an easily-handled shot on goal in the 42nd minute. The wet ball slipped through the hands of Benfica keeper Costa Pereira to give Inter a 1-0 lead. Which, as it turned out, was all they needed as Benfica proved unable to crack the Italians' defense. Inter returned to the Final twice more, losing to Celtic in 1967 and Ajax in 1972 before winning their third European Cup/Champions League trophy in 2010 over Bayern Munich. 26 May 1989 - "It's Up For Grabs Now!" 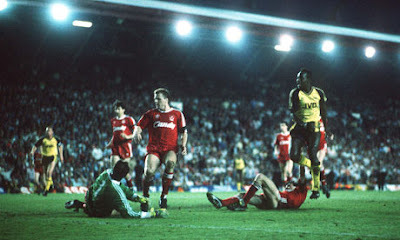 On 26 May 1989, Arsenal won the League in dramatic fashion, beating runners-up Liverpool 0-2 at Anfield in the last match of the season. Despite leading the race for the title earlier that spring, a recent loss to Derby County and a draw with Wimbledon left Arsenal in second place, three points behind Liverpool. Liverpool also had a better goal differential which meant that Arsenal needed not only to win, but to win by two goals. It seemed an impossible task, as Liverpool had not lost by two more or goals at Anfield all season (and had, in fact, lost there only twice all year). It was an emotional day, with Liverpool still feeling the effects of the Hillsborough disaster from the previous month in which 96 of their supporters died due to overcrowding and police mismanagement. Recognizing that, Arsenal manager George Graham planned to keep the game close for the first half, try to get a goal early in second half, then push a second. Which is almost exactly how it played out. After a scoreless first half, Arsenal striker Alan Smith scored a 52nd-minute goal after a Nigel Winterburn free kick. With about 14 minutes left in the match, and Arsenal still leading 1-0, Graham switched the Arsenal formation from a defensive 4-5-1 to a more attacking 4-4-2. Liverpool took advantage of the extra space in midfield to launch several counter-attacks, but could not produce an equalizer. In the second of three minutes of injury time, Arsenal keeper John Lukic rolled the ball out to right back Lee Dixon, who sent a long pass to Smith. Smith lobbed it into the path of a charging Michael Thomas just outside the Liverpool box. Thomas (pictured at right) evaded Liverpool defender Steve Nicol, then chipped the ball over the diving Liverpool keeper, Bruce Grobbelaar. It went into the net with 25 seconds to spare - deciding the title with the final goal in the final minute of the season's final match. Commentator Brian Moore reported the action saying "Thomas, charging through the midfield ... it's up for grabs now ... Thomas, right at the end!" The match has since been recognized as one of the most dramatic title wins in English history and featured in the 1997 film "Fever Pitch." On 25 May 2005, Liverpool won their fifth European Cup/Champions League trophy, coming back from a 3-0 deficit to beat AC Milan on penalties 3-3 (3-2) before a crowd of 70,000 at Istanbul's Atatürk Olympic Stadium. The win salvaged an otherwise disappointing season for the Reds, who had finished the Premier League season in fifth place after an early FA Cup elimination and a loss to Chelsea in the League Cup Final. 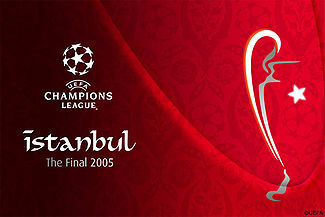 The win also allowed Liverpool to compete in the next season's Champions League - their fifth-place League finish was outside the four qualification spots, but UEFA granted them a special exemption to compete in 2005-06 as title holders. Milan were favored to win and, true to form, took an early lead with a volley from captain Paolo Maldini after only 51 seconds (it was the fastest-ever goal in a European Cup/Champions League Final and made the 36-year old Maldini the competition's oldest-ever goalscorer). Liverpool attacked the Milan area, but were unable to break through the Italians' defense. Liverpool's efforts exposed them to a counter-attack, resulting in two more Milan goals before the break, both from Argentinian striker Hernán Crespo (38', 42'), on loan from Chelsea. Milan's 3-0 lead looked insurmountable, but Liverpool renewed their pressure after the break. They played only three defenders in order to bolster their attack, which paid dividends when they scored three goals in a six-minute period (Gerrard 54', Šmicer 56', Alonso 60') to draw level. Despite Liverpool's weakened back line, Milan were unable to score and the match went to extra time, then to penalty kicks. Milan went first in the shootout and missed their first two kicks - the first went over the bar, while the second was easily saved. Liverpool made their first two, but their third was saved, so that after four kicks, Liverpool were ahead 3-2. Milan's Ukrainian striker Andriy Shevchenko, who had scored the winning penalty in the 2003 Final, stepped up to take Milan's last kick, knowing that he needed to convert it in order to prevent Liverpool from winning. Unfortunately for Milan, he sent it right down the middle where it was saved by keeper Jerzy Dudek. 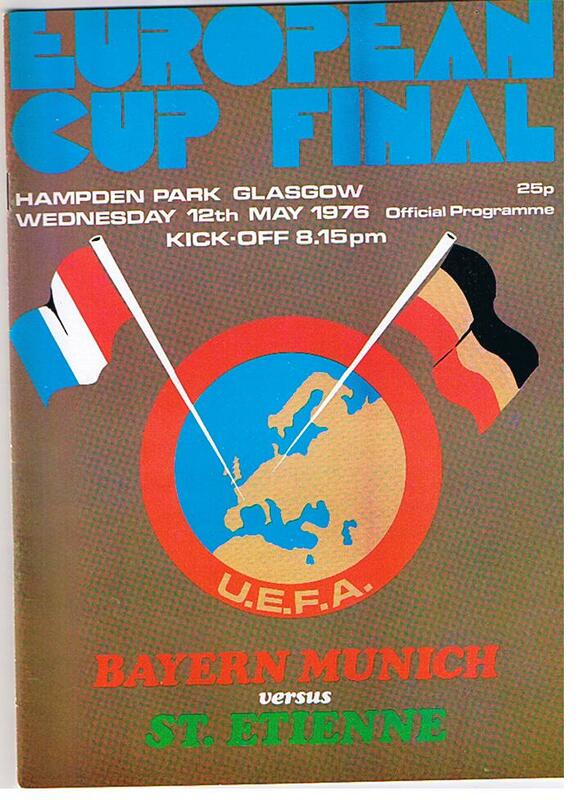 On 24 May 1972, Scotland's Rangers won their first (and to date only) European trophy, beating Dynamo Moscow 3-2 in the UEFA Cup Winners' Cup Final before 24,000 at Barcelona's Camp Nou. Despite the tournament's name, Rangers (pictured, post-match) are one of five teams to win the competition without actually entering as a cup winner. The tournament, played from the 1960-61 season to the 1998-99 season, was open to the winners of the domestic cup competitions in UEFA's member states. But the defending Scottish Cup champion that year was Celtic, who also qualified for the European Cup by winning the league, so Rangers, as the Scottish Cup runners-up, took the spot. Dynamo, on the other hand, qualified in the traditional manner by winning the 1970 Soviet Union Cup. All eyes in the USSR were on them, as they were the first Soviet team to make it to a European final. Still, only about 400 supporters traveled from Moscow, compared to over 16,000 for Rangers. The Scots dominated the first fifty minutes, going up 3-0, but Dynamo pulled one back at the hour mark, then heightened the tension by scoring a second in the 87th minute. With one minute remaining, thousands of Rangers supporters invaded the pitch, thinking the match was over. The match stopped while the pitch was cleared, then when the final whistle sounded, the Rangers supporters rushed the pitch again, clashing with the police in several altercations. As a result of the supporters' actions, UEFA banned Rangers from the next season's competition, preventing them from defending their title. Labels: FC Dynamo Moscow, Rangers F.C. 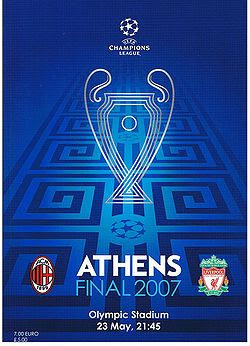 On 23 May 2007, AC Milan won their seventh European Cup/Champions League trophy, beating Liverpool 2-1 at the Olympic Stadium in Athens in a rematch of the 2005 Final. It was a dramatic finish for Milan, who had earlier been barred from competing in the tournament as a result of their involvement in the Serie A match-fixing scandal of 2005-06. But on appeal, the Italian football association allowed Milan to enter the competition in the third qualifying round, rather than directly into the group stage. Both Liverpool and Milan won their groups, but faced difficult roads to the Final. Milan beat Celtic (1-0 agg. ), Bayern Munich (4-2 agg. ), and Manchester United (5-3 agg.) on their way to the Olympic Stadium, while Liverpool advanced over Barcelona (2-2 agg. - Liverpool won on away goals), PSV (4-0 agg. ), and Chelsea (on penalties, 1-1 (4-1)). Despite having two of the tournament's top scorers - Milan's Kaká had a tournament-high 10 goals going into the Final, while Liverpool's Peter Crouch was tied for third with 6 goals - the defenses held strong through most of the first half (Crouch didn't come on until the second half). Milan striker Filippo "Pippo" Inzaghi broke the deadlock with a controversial 45th-minute goal that appeared to deflect off of his arm past keeper Pepe Reina. Liverpool pressed for an equalizer in the second half, but were unable to beat Milan's goalkeeper, Dida. Inzaghi then scored a second goal in the 82nd minute. The match appeared to be won, but Liverpool's Dirk Kuyt made sure the last few minutes were exciting when he found the net in 89th minute. Liverpool could not muster a second, however, and the match ended as a 2-1 Milan win. On 22 May 1999, forward Mia Hamm scored her 108th goal for the US women's team, making her the all-time leading scorer in international history. 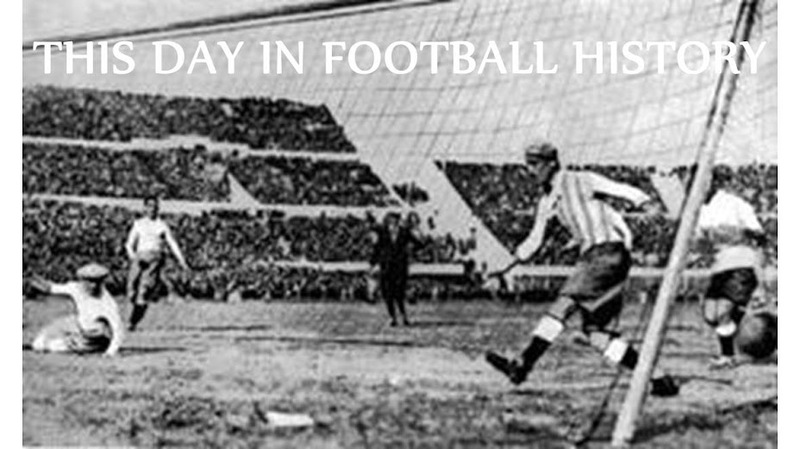 The record-setting goal came a the end of the first half in a friendly against Brazil, played at the Citrus Bowl in Orlando, Florida. The score was tied at 0-0 when teammate Cindy Parlow sent the ball into the path of Hamm in the Brazilians' penalty area. Hamm cut to the right, fought off a defender, then shot the ball through the legs of Brazilian keeper Dida to put the US ahead 1-0. Brazil applied intense pressure in the second half, forcing a handful of acrobatic saves from US keeper Brianna Scurry, but were unable to find the back of the net. The hosts then extended their lead to 2-0 when forward Kristine Lilly received a 72nd-minute corner kick and kneed it home. The US scored the final goal in the 87th minute as Brandi Chastain took a quick throw that caught the Brazilians off guard. The throw went in the box to Lilly, who headed it down to Tiffany Milbrett for a strong volley into the goal. The match was a warm-up for the 1999 World Cup, which opened the next month. The US went on to win their second World Cup trophy beating China in the Final. Brazil finished in third. It was Hamm's 172d match for the US. Before her retirement in 2004, she made a total of 275 US appearances and extended her scoring record to 158. That remained the world record until 2013, when Abby Wambach scored her 159th goal (Wambach's current total is 182). On 21 May 2003, Porto won the UEFA Cup, beating Celtic 3-2 in extra time at Seville's Estadio Olímpico. It was the first European honor for Porto manager José Mourinho, who built on the success by winning the Champions League the next season. Under normal circumstances, Celtic would have been heavy favorites. But, at the time of the match, Porto had already secured the Portuguese Liga title with two matches to spare and were completely focused on the Final. Celtic, meanwhile, were tied on points with SPL leader Rangers, but behind on goal differential with one match left. In addition, the day's hot weather forced the teams to play at a slower pace, which also favored Porto. Porto's midfield general Deco orchestrated a first-half attack that put his side ahead in the 45th minute as midfielder Dmitri Alenichev's shot was parried by Celtic keep Robert Douglas into the path of Porto's Brazilin forward, Derlei, who drove it home. The lead did not last long, however, as Henrik Larsson - that year's top SPL scorer - equalized with a 47th-minute header. It was his tenth goal of the tournament and his 200th goal for Celtic. Two more quick goals followed, with Alenichev putting Porto ahead once more in the 54th minute, then Larsson finding another equalizer in the 57th minute. The teams were stalemated at 2-2 through the end of regulation, forcing the match into extra time and triggering the silver goal rule. The Final was the first match played under the silver goal rule, which meant that a lead for either side after the first half of extra time would end the match. As it turned out, though, neither team scored in the first period, so they played the full allotment of time. In the 115th minute, Derlei again pounced on a Douglas block to score the goal and seal the win. It was Porto's first European trophy in 16 years, but they would not have to wait as long for the next one, as they beat AS Monaco in the next season's Champions League Final. Celtic, meanwhile, went on to lose the SPL title race to Rangers despite winning their last match 4-0, as Rangers won theirs 6-1. On 20 May 1993, Marseille beat Valenciennes 1-0 to secure their fifth consecutive Ligue 1 title with one match left to play. Later, however, French authorities learned that Marseille had bribed three Valenciennes players and stripped the title from the club. The press labeled the ensuing scandal "L'affaire VA-OM." Marseille were motivated by their upcoming Champions League Final against AC Milan, scheduled for 26 May. While they heavily favored to beat Valenciennes anyway, they wanted to guard against injuries and still clinch the win so that they could rest their players in their final league match against title-chasers Paris Saint-Germain. It apparently worked, as Marseille beat Milan 1-0. The investigation revealed that, the night before the match, Marseille player Jean-Jacques Eydelie had offered money to three Valenciennes players in exchange for their agreement that they would not try to hard against Marseille. Eydelie claimed that he was acting under the instruction of the club's general secretary, who in turn claimed that he had been instructed by club president Bernard Tapie (pictured). In turn, Tapie claimed that it was not a bribe, but that instead he had loaned 250,000 francs to one of the Valenciennes players in order to help him start a restaurant. The FFF stripped Marseille of the 1992-93 title and it remains unassigned, as second-place finishers PSG refused to accept it. 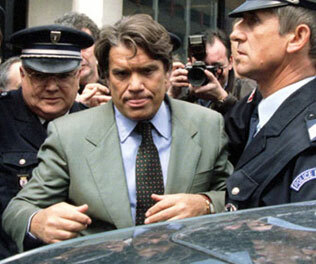 Tapie served five months in jail, while Eyedelie served seventeen days. The Valenciennes players received six-month suspended sentences and a two-year league ban. Both Marseille and Valenciennes were relegated to Ligue 2. UEFA allowed Marseille to keep their Champions League trophy, but barred them from appearing in the next season's competition. On 19 May 1957, Scotland defeated Switzerland 1-2 in a World Cup qualifier in Basel, but they had to do it in shirts borrowed from the Swiss. Ordinarily, the blue shirts of the Scottish national team would have been fine, as the Swiss shirts were red. But, according to Tommy Docherty, who started in the midfield for the Scots that day, the match was televised across Europe in black and white. Without color, officials were concerned that viewers would have difficulty distinguishing between the sides. The Scots, however, had not brought a change kit, so they had to borrow Switzerland's, which used white shirts trimmed in red. That matter settled, the Swiss took an early lead, going up 1-0 in the 13th minute with a goal from forward Roger Vonlanthen. Scotland, though, battled back against the Swiss and the progressively deteriorating weather to level the match with a 33rd-minute goal from forward Jackie Mudie (pictured). Level at the break, the Scots continued to press in the second half and were rewarded by a 71st-minute match-winner from midfielder Bobby Collins - his first international goal. The win put Scotland at the top of their qualification group. After two more matches (a loss to Spain and another win over the Swiss) they advanced to the World Cup, where they were eliminated in the group stage. On 18 May 1994, AC Milan dismantled Barcelona 4-0 in the UEFA Champions League Final at the Olympic Stadium in Athens. It was Milan's fifth European Cup/Champions League title. The teams looked evenly matched on paper, as both had won their domestic leagues that season and both had advanced from the earlier rounds with ease, winning their groups before cruising through the semifinals. Both also had recent experience in the Finals; Milan finished as runners-up the previous season, while Barcelona won the Final the season before that. If either side had an edge, most considered it to be Barcelona, as Milan were missing key players to injury (Marco van Basten and Gianluigi Lentini) or suspension (captain Franco Baresi). The Italians, under manager Fabio Capello, rose above the circumstances to dominate the match from the beginning. They were led by forward Daniele Massaro, who recorded a brace before half-time (22', 45'). Shortly after the break, forward Dejan Savićević—who had provided the assist for Milan's first goal—chipped the Barça keeper to extend the lead to 3-0 in the 47th minute. Barcelona, managed by Johan Cruyff, failed to mount any serious challenge and Milan defender Marcel Desailly—who had played for Marseille in the previous Final and beat Milan—added a fourth goal in the 59th minute to conclude the day's scoring. 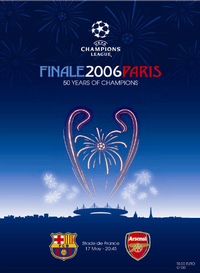 On 17 May 2006, Barcelona defeated Arsenal 2-1 in the Champions League Final, played at the Stade de France in Paris. It was the second European Cup/Champions League trophy for the Catalonians, who added a third in 2009, a fourth in 2011, and hope to make it five next month. The match was hyped as featuring two of the sport's greatest players at the time - Barcelona's Ronaldinho and Arsenal's Thierry Henry. But the match's first goal was scored by Arsenal defender Sol Campbell, who headed in a 35th-minute free-kick to give the Gunners a surprising lead - surprising because the English side were down to ten men after keeper Jens Lehmann had been sent off in the 7th minute for fouling Barça's Samuel Eto'o outside the box. Despite being a man down, the Gunners held on to their advantage through the remainder of the first half and deep into the second, while still attacking the Barcelona goal. The next goal, however, was Barcelona's, as midfielder Andrés Iniesta played a long pass to Eto'o, who scored a 76th-minute equalizer. Four minutes later, a Barcelona cross found second-half substitute Juliano Belletti, who fired the ball through Almunia's legs for the lead and the win. Leading up to the match, several rumors circulated about Barcelona's interest in signing Henry. He eventually signed with them in 2007 and went on to win the Champions League with them in 2009. On 16 May 2009, German side Duisberg (pictured) took a giant step toward winning their first UEFA Women's Cup, beating Russia's Zvezda Perm 0-6 in the first leg of the Final at the Central Stadium in Kazan, Russia. The scoreline was no anomaly; Duisberg had rolled through the earlier rounds in similar fashion, including a 5-1 win over Ukranian side Naftokhimik and a 5-0 win over Levante, both during the group stage, and an aggregate 1-5 victory over their fellow German side (and defending UEFA Women's Cup champions) Frankfurt in the quarterfinals. The Russians, however, had advanced to the Final with a series of closer matches, never winning by more than two goals. The first leg of the Final stayed close for most of the first half, with Zvezda keeper Nadezhda Baranova denying a 12th-minute Duisberg penalty to keep the match scoreless until the 42nd minute, when Duisberg's Famke Maes scored to put her side up 0-1. Zvezda attacked the Duisberg goal in the second half, but paid the price when Duisberg counterattacked and won another penalty for a second handball. Duisberg captain Inka Grings converted the 64th-minute kick, doubling the visitors' lead. After that, the floodgates opened. Grings scored twice more to complete her hat-trick and also notched an assist on another goal. Maes also scored again for a brace. The 6-goal advantage proved too difficult for Zvezda to overcome in the second leg, which ended as a 1-1 draw six days later in Duisberg, giving the German side their first Cup. Grings finished as the tournament's top scorer with seven goals. 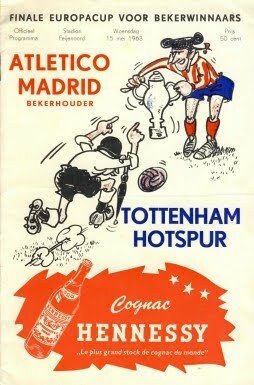 On 15 May 1963, Tottenham Hotspur became the first British club to win a European trophy by beating defending champions Atlético Madrid 5-1 in the European Cup Winners' Cup Final. And Spurs were truly a British club - all eleven starters and manager Bill Nicholson were from the Home Countries of England, Scotland, Wales, and Northern Ireland. As its name implies, the Cup Winner's Cup, which was first played in the 1960-61 season, pitted the various winners of the European domestic cup competitions against each other. Spurs reached the Final with wins over previous finalists Glasgow Rangers in the first round, followed by wins over Czech side Slovan Bratislava and Yugoslavia's OFK Beograd. Atlético's road to the Final was paved with victories over Maltese side Hibernians, Bulgaria's Botev Plovdiv, and Germany's Nuremberg. Played at Rotterdam's Feyenoord Stadium before a crowd of 49,000, the Final was close for about a half. Tottenham forward Jimmy Greaves scored first in the 16th minute, then his fellow forward John White extended the lead to 2-0 in the 35th minute. The Spanish side pulled one back shortly after the break, when forward Enrique Collar converted a 47th-minute penalty kick, but it was all Spurs after that. Forward Terry Dyson restored the two-goal advantage with a 67th-minute strike, then both he and Graves completed braces (Greaves 80', Dyson 85') to finish the match 5-1. Before UEFA discontinued the Cup Winners' Cup after the 1998-99 season, a handful of British clubs followed after Spurs, including West Ham (1965), Manchester City (1970), Chelsea (1971 and 1998), Rangers (1972), Aberdeen (1983), Everton (1985), Manchester United (1991), and Arsenal (1994). Labels: Atlético Madrid, Enrique Collar, Jimmy Greaves, John White, Terry Dyson, Tottenham Hotspur F.C. On 14 May 1938, England opened their European tour by defeating Germany 6-3 at Berlin's Olympic Stadium before a crowd of 110,000, including several high-ranking Nazi officials. 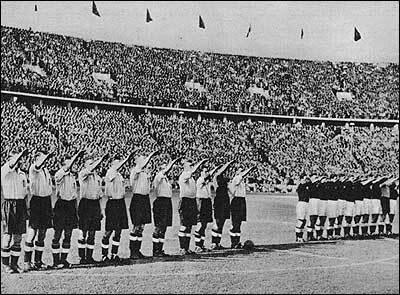 But the match is best remembered for the political statement made by the English players, all of whom gave the infamous Nazi salute at the start of the match. The salute was an effect of Britain's appeasement policy at the time, intended to show the Germans that England respected their sovereignty. To the players' credit, when first asked to give the salute, they refused. The request came from a Football Association official who entered the dressing room as the players were preparing for the match and asked them to give the salute during the playing of the German national anthem. According to inside-right Stanley Matthews "The dressing room erupted. There was bedlam. All the England players were livid and totally opposed to this, myself included. Everyone was shouting at once. Eddie Hapgood, normally a respected and devoted captain, wagged his finger at the official and told him what he could do with his Nazi salute, which involved putting it where the sun doesn't shine." The official left the dressing room, but returned with a direct order from the British Ambassador to Germany, Sir Neville Henderson, who instructed the players to give the salute. Henderson informed them that the political relationship between England and Germany at the time was so sensitive that failure to show deference could be the "spark to set Europe alight." Faced with the apparent choice between giving the salute and starting World War II, the English players (pictured above, in the white shirts) raised their arms. Less than sixteen months later, England and Germany were at war. The act drew fierce criticism from the British press and still does. The BBC recently called it "one of England's darkest moments in the sport." On 13 May 2006, FC Basel hosted rivals FC Zürich in the last match for both clubs in the Swiss Super League season. The match - and the league title - were decided by a last-second goal in stoppage time to give Zürich their first league title in 25 years. Basel, who had won the two previous league titles, started the day in first place, three points ahead of Zürich. The visitors, however, had a better goal differential, which meant that a win would push them over Basel into first place in the final league table. It was an ugly match, with both sides committing several hard fouls, and it was close. By the end of regulation, the score was 1-1, which had the Basel supporters celebrating their imminent third consecutive title. But in the third minute of injury time, the referee awarded Zürich a throw-in. The throw went down the right side of the pitch to Zürich midfielder Florian Stahel, who crossed it into the Basel penalty area where it found his teammate, defender Iulian Filipescu. With only seconds left in the match, Filipescu fired the ball into the net past Basel keeper Pascal Zuberbühler to put Zürich ahead 2-1. The referee ended the match right after the goal. As the Zürich players and team officials celebrated the win, they were attacked by dozens of Basel supporters who poured onto the pitch. For his heroics, Filipescu was singled out by several of the Basel fans, one of whom threw a flare at the Romanian defender. Even after the teams left the stadium, fighting continued between hooligans and local police well into the night. On 12 May 1976, Bayern Munich won their third consecutive European Cup, beating Saint-Étienne 1-0 at Glasgow's Hampden Park. It is the last time that any club has won three straight competitions and only the third time that a club has won more than two consecutive Finals. Saint-Étienne, that season's Ligue 1 champions, had already visited Hampden Park in that year's competition - they beat Rangers there by the score of 1-2 in the second leg of their Second Round meeting with the Scottish club to advance 4-1 on aggregate. As a result, thousands of Scottish supporters turned out to cheer them on in the Final. Combined with the French club's own visiting fans, approximately 45,000 of the 55,000-strong crowd were supporting Saint-Étienne. The Final was a close contest. Bayern thought they had taken an early lead, but Gerd Müller's goal was flagged (incorrectly) as being offside. The French side then had a number of first half opportunities, but could not take advantage. A 34th-minute shot from midfielder Dominique Bathenay beat Bayern keeper Sepp Maier, but hit the crossbar. Five minutes later, midfielder Jacques Santini's shot just missed the net, slipping inches wide of the goalpost. The missed chances shook the confidence of the Saint-Étienne players and Bayern took control of the match early in the second half, as midfielder Franz Roth turned a 57th-minute Franz Beckenbauer free kick into the net. The French side attacked with renewed vigor, but were unable to get past the Germans' defense. Bayern's victory matched the accomplishment of Ajax, who won the European Cup three straight times from 1971 to 1973. The only team with a better streak is Real Madrid, who won the first five European Cups from 1956 to 1960. 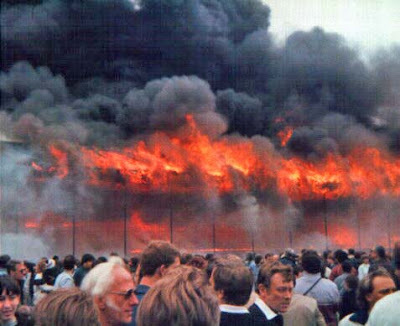 On 11 May 1985, Bradford City's Valley Parade stadium caught fire during their last match of the season, killing 56 spectators and injuring 265 others. The day started triumphantly for Bradford City. They had secured the Division Three title five days earlier with a 2-0 win over Bolton Wanderers, so the League presented the trophy to the club before their match, played against Lincoln City. The presentation brought 11,076 people out to see the match, almost double the season average of 6,610. People in the crowd noticed the first signs of fire under the main stand about five minutes before the break. Later reports described it as a "glowing light," possibly from a dropped match or cigarette that landed on trash and debris that had collected under the stand. The fire spread quickly across the wooden stand and roof, so that, within four minutes, the entire stand was engulfed in flame. The roof dropped burning timbers and other material onto the crowd, some of whom tried to escape through the back of the stand, while other rushed onto the pitch, helped by police officers and Bradford City striker John Hawley, who climbed into the burning stand to help rescue a stranded supporter. Of the 56 people who died, several succumbed to smoke inhalation, while others were crushed in the panic or were burned. One of the fatalities was 86-year old Sam Firth, a former chairman of the club. Sadly, prior to the fire, several people had warned the club about the need to replace the wooden stand and roof and to clear the debris from under the stand, but Bradford City had been slow to implement renovations. But having secured promotion, they had just ordered a new steel roof and concrete terracing that would have minimized any damage. The stadium re-opened in December 1986 and remains home to Bradford City. On 10 May 1980, Celtic won their 26th Scottish Cup, beating Rangers 1-0 before a crowd of over 70,000 at Glasgow's Hampden Park. The match itself was overshadowed by the pitch invasion afterward, followed by a riot among the rival supporters. The Final was the last chance for either team to claim a major trophy that season, as both had been eliminated from the League Cup and Aberdeen had won the SPL a week earlier, one point ahead of second-place Celtic. Rangers finished back in fifth place. Nevertheless, the Final itself was fairly tame. Neither team created many chances and they were scoreless after 90 minutes. Celtic found the advantage in extra time as forward George McCluskey diverted a Danny McGrain volley past Rangers keeper Peter McCloy. It was the only goal of the match, enough to give Celtic the 1-0 win and the Scottish Cup. As the referee blew the final whistle, a multitude of Celtic supporters rushed onto the pitch. But what started as a victory celebration soon turned into a full-scale riot, as Rangers supporters joined their opposite number on the pitch and several fights broke out. The police tried to separate the two groups, but were hopelessly outnumbered. Afterward, the SPL determined that alcohol had been a major contributor to the violence and banned its sale at league matches. Despite recent pleas to lift the ban, it remains in place. 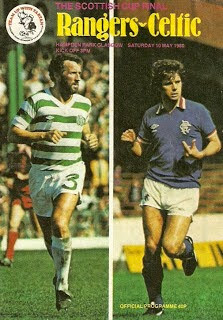 Labels: 1980 Scottish Cup Final, Celtic F.C., Danny McGrain, George McCluskey, Peter McCloy, Rangers F.C. 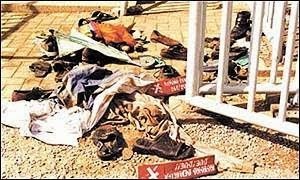 On 9 May 2001, 126 football fans died at the Accra Sports Stadium, making it Africa's worst ever sports-related disaster. It was one of several such incidents in Africa over a period of less than a month, including similar disasters in South Africa (43 killed on 11 April), the Congo (14 killed on 29 April), and the Ivory Coast (39 killed on 6 May). The fans were in Accra that night to watch a derby match between hosts Hearts of Oak and fellow Accra club Asante Kotoko. The visitors were up 1-0 near the end of the match, but Hearts of Oak scored two late goals to take the lead. With about five minutes left, frustrated Asante Kotoko supporters began ripping seats out of the stands and throwing them onto the pitch. The police responded by firing tear gas into the crowd, causing a panic. Most of the victims were crushed in the ensuing stampede, while a few died from suffocation. 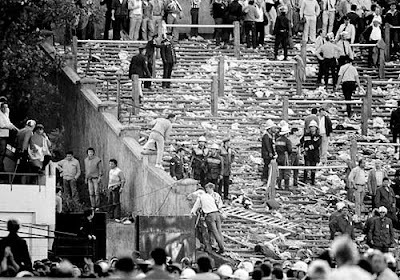 Although six policemen were charged with manslaughter, authorities later determined that the tragedy was compounded by the fact that several stadium gates were locked at the time, preventing the crowd from escaping. The Ghanian government established a special scholarship for children of the victims and also erected a memorial statue at the stadium, which has since been renamed Ohene Djan Stadium.